Allison Celik, MA, and Bushra Sabri, Ph.D. This report summarizes results from an online survey of Muslim attitudes and experiences of domestic violence. Further results will be available on Project Sakinah’s website after completing a detailed analysis of all the data. Domestic violence has deep roots and profound individual, community and societal consequences. It is a problem which is pervasive in families across the United States, regardless of race, education, income or religion, and the Muslim community is no exception. The negative costs and impacts of abuse have lifelong consequences, and the effects ripple out into communities at large. Domestic violence is a major contributing factor to other problems, including child neglect, drug and alcohol abuse, emotional problems, job-loss, homelessness, and attempted suicide. Domestic violence is generally defined as “any abusive, violent, coercive, forceful, or threatening act or word inflicted by one member of a family or household on another.” It includes intimate partner violence, child abuse and elder abuse. It is important to remember that while all families fight and have disagreements, a victim of abuse live in fear of his or her abuser. Domestic abuse is rarely a single event, but a pattern of coercive, controlling or threatening behaviors which one person (the abuser) uses to gain and maintain power and control over another person (the victim). Abuse can be emotional, verbal, physical, sexual or financial. There is a web of interconnectedness among different forms of violence in the home, and often there may be more than one victim. Children, women, men, grandchildren and grandparents can all be victims of domestic violence. Where is this report from? In 2011, Peaceful Families Project and Project Sakinah conducted an online survey of the Muslim population in America to better understand both attitudes toward and experiences of domestic violence among Muslims. We received 801 responses from across the country. The survey was designed and refined by Maha B. Alkhateeb and Salma Elkadi Abugideiri of Peaceful Families Project, and is a follow-up to a previous Peaceful Families Project survey from 2006. The results were compiled and analyzed by Allison Celik of Project Sakinah. Dr. Bushra Sabri from Johns Hopkins University reviewed and edited the report. Anas Coburn (Project Sakinah) and Sharon O'Brien (Peaceful Families Project) provided overall direction to the report. Peaceful Families Project is a national organization devoted to ending domestic violence in Muslim families by facilitating awareness workshops for Muslim leaders and communities, providing cultural sensitivity trainings for professionals, conducting research and developing resources. What was the extent of domestic violence in Muslim families? The experience of domestic abuse in our communities is pervasive, with victims from all ages and all walks of life. Two thirds of survey respondents(66%) knew someone who was a victim of physical abuse. Among people who identified themselves as community leaders, this was even higher, (80%) possibly reflecting the tendency of victims to seek help or advice from people they identify as community leaders. When asked: “Have you experienced family/relationship related violence ever in your lifetime? This could include emotional abuse, verbal abuse, physical abuse, sexual abuse, and financial abuse” More than half of the survey respondents (427 people, or 53%) responded “yes”. 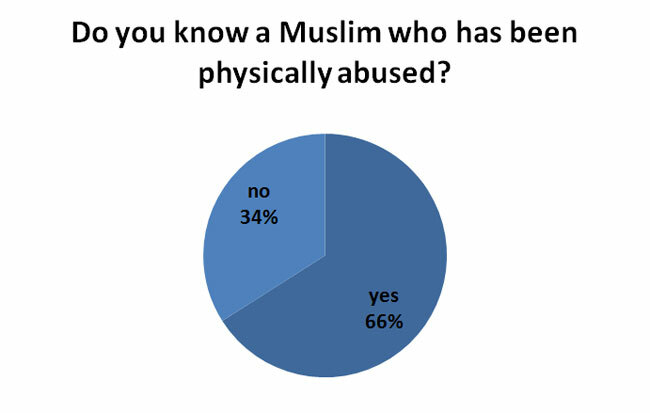 In other words, one out of every two Muslims who took our survey had experienced abuse. More women reported abuse than did men. 56% of women and 44% of men who responded reported having experienced some type of abuse over the course of their lifetime. A substantial number of respondents reported multiple types of abuse experiences. Among adults who have experienced abuse in an intimate relationship, what were the reported effects? Depression, low self-esteem, shame, helplessness, hopelessness and anxiety were the most frequently reported negative mental health effects of abuse. Most commonly reported physical health effects of abuse included bruises, aches and pains and nausea and vomiting. What were the barriers to escaping abuse? Victims who stayed after the abuse occurred cited a range of concerns ranging from not knowing what else to do, hoping their abuser would change, concern about children, feeling that leaving would be inappropriate, to simply feeling too scared and alone to take action. What were the community attitudes towards domestic violence? Almost everyone (96%) responded that family abuse was never acceptable. 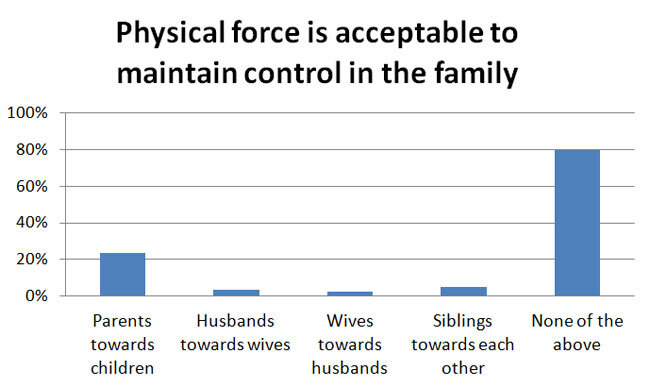 Furthermore, a significant majority (80%) said the “physical force in order to maintain control in the household is never acceptable”. The remaining 20% were almost exclusively people who agreed that it was acceptable for parents to use physical force to maintain control over children, with many noting that sometimes the child puts themselves in danger, and must be stopped. When the respondents learned about an abusive situation, their most common responses were to pray for the victim (43%) or to talk to him or her (44%). The inclination for friends and neighbors to talk to the victim shows the need for our communities to be well informed about options and resources available to victims of abuse. What services are already available in our communities? Over half of the survey respondents (56%) reported that their mosque has offered a Khutbah on domestic violence more than once. 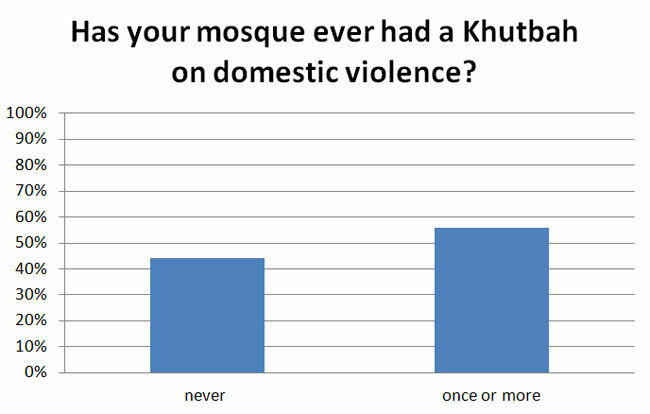 For just under half of the respondents (44%), their mosque never offered a khutbah on domestic violence. Approximately one in five (20%) of the respondents knew about the availability of Muslim domestic violence shelters or social service programs in their community. A substantial percentage (35%) of respondents reported that their community had no educational resources or direct services available to assist victims of domestic violence. Thus, while the numbers show the beginnings of efforts to end domestic violence in Muslim homes, many communities have yet to address domestic violence at all. Keeping in mind that 53% of Muslim respondents reported having experienced abuse at some point in their lives, this gap in access to knowledge and understanding about ways to end domestic violence is critical. What would we like to see in our communities? 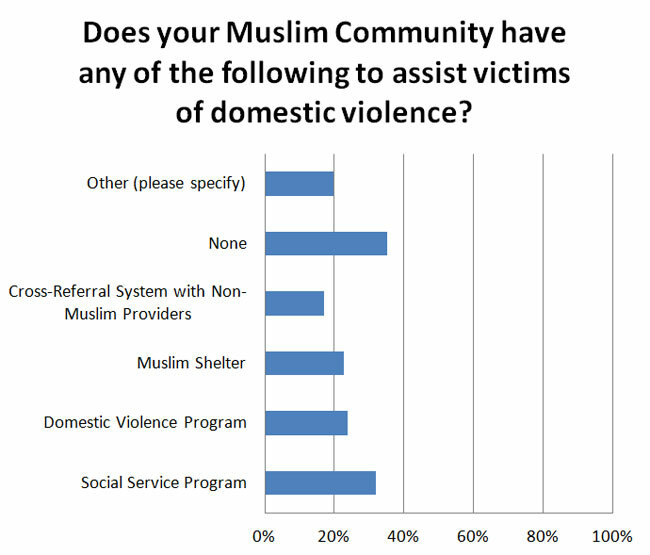 When asked “What types of services do you think a domestic violence program serving the Muslim community should provide?” survey responses were overwhelming proactive. Across the board, people wanted more information and education in their communities to learn about domestic violence; what it is, how to recognize it, how to help victims, and what types of Islamic rulings can be used to explain that it is wrong. But the respondents to our survey did not stop there. The majority also envisioned Muslim communities which would offer Islamically based professional and confidential counseling for families, intervention when needed, along with legal and financial help for women who wanted to leave abusive situations. Many people mentioned the need for more Muslim foster families, to help child abuse victims. When asked, “What role do you think imams and community leaders should play in addressing domestic violence for victims, survivors, and the general community?” our respondents were equally clear. The majority felt that imams should provide education and leadership to the community, in communicating clearly that Islam does not tolerate or excuse domestic violence. Many respondents also felt that the more professional information and training about domestic violence that the imam himself had, the better he would be able to make referrals when necessary, and recognize family violence when he saw it. This study shows that domestic violence is a common experience among Muslim families and is associated with negative health consequences. Efforts to reduce violence in Muslim families must focus on decreasing vulnerability and health consequences through culturally competent prevention and intervention strategies. Such efforts require coordinated community responses including victim service advocates, imams, community leaders, and health care practitioners. Prevention efforts include community education and awareness programs on domestic violence issues, and promoting healthy relationships in Muslim families. The programs should be implemented at the school, family, and community levels. The imams and community leaders are important resources for Muslim victims of abuse. However, in some circumstances, imams and community leaders may not be equipped to respond effectively to difficult situations, identify serious concerns, or provide referrals for victims of abuse. They must receive education and training in identifying cases of domestic violence, providing information about safety planning and community resources for victims. Further, the lack of availability of resources for victims of domestic violence is a serious concern. Enhanced efforts are needed to create access to resources that support Muslim families in abusive relationships.